The principles and practices of green building have had a transforming effect on the way we build, work, and live. By ‘green’ I refer to a collective of high-performing objectives in sustainability, energy-efficiency, healthy building, and resiliency. Inherent to its mission are claims of improved building performance – that is, perceived betterments in resource use, energy efficiency, and building service life. Directives further brim with expectations for improved health, comfort, and productivity. And, according to some, the payback to society knows no bounds. The natural leap in logic, or at least perception, is that green buildings are better performing buildings, or just better buildings. But are they? Below I illustrate the tenuous nature of how green design can fall short of expectations. In an earlier article, I questioned materials and design practices used by the Make It Right Foundation, a charitable home builder founded by the actor Brad Pitt (article). 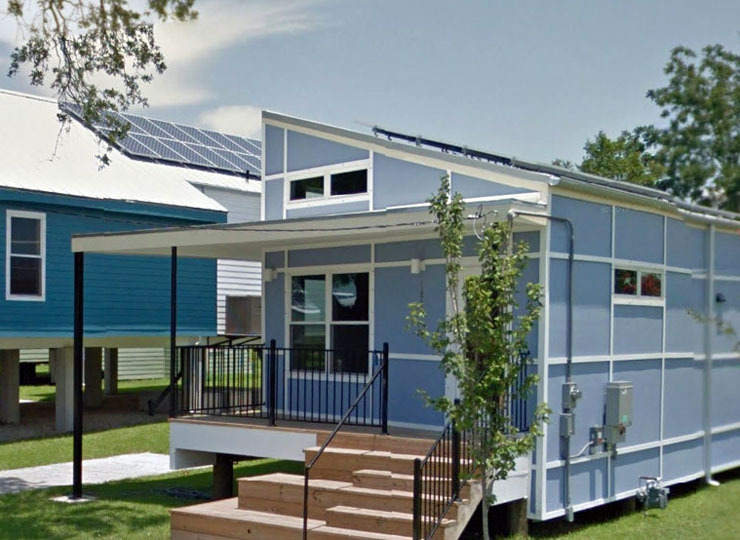 Make It Right is heavily involved in the revitalization of New Orleans’ Katrina-ravaged Lower 9th Ward. The foundation has also embarked on similar projects in areas affected by Superstorm Sandy; urban blight in Kansas City, Missouri; and a Native American reservation in Fort Peck, Montana. Its practices advocate LEED Platinum specifications with a goal of delivering high-performing, healthy buildings that are also storm-resistant. The prevailing wall type employs structural insulated panels (SIPs) clad with fiber cement siding. Assemblies include housewrap weather-resistive barriers but lack vented or ventilated rainscreens. This wall type reflects a concealed barrier approach where the siding serves as the primary means of water diversion and the weather-resistive barrier serves a secondary function in managing incidentally intruded water. Concealed barrier systems are prone to high water infiltration and poor durability, a fact widely known since the early 1990s and punctuated by the misfortune that became the Pacific Northwest’s ‘leaky condo crisis’. The issue here is not the lack of rainscreens. After all, homes in New Orleans have been built without rainscreens for over 200 years. The real question pertains to the assembly as a whole. Inherent to concealed barrier design is the assumption that some water will enter behind the wall cladding. The amount of anticipated intrusion varies based on cladding type and construction practices, but it is reasonable to assume that a minimum of 1% of the wind driven rain will reach the exterior face of the weather-resistive barrier. This assumption forms an important basis in current moisture control design standards such as ASHRAE 160. A conventional framed wall assembly for New Orleans would generally accommodate this burden, but the air-tight, moisture-impeding SIPs show a lower potential for drying. Performance is also affected by the SIPs’ OSB shells which have a tendency to release moisture less efficiently than plywood and dimensional lumber. Now we add to this a board & batten fiber cement siding that is also prone to reduced service life when used with typical concealed barrier practices (article). The figure below illustrates moisture performance for the Make It Right SIP assembly as predicted by one-dimensional hygrothermal modeling. Details of the analysis can be found in Hygrothermal Snapshot No. 14. The model outcome suggests moderate to high relative humidity for a good portion of the year. Adding a ventilated rainscreen does not significantly improve the situation. As with many wall assemblies, whether vented or not, the 1% rain load can present a daunting challenge. While some question the reasonableness of such a burden, one can equally argue for even higher infiltration, especially in coastal, storm-plagued regions. It is important to note that the above graph simply illustrates tendencies, not absolutes with respect to actual moisture performance. This design may perform quite well without the 1% rain infiltration load. The model has identified only the potential for under-performance in the climate for which it was intended. But without question, the design accepts much risk and assumes little error – an approach not desired for designs claiming high-performance and storm resistance. I have singled out Make It Right because it exemplifies what is right and what is wrong with current green practices. Like many similar grass roots initiatives, it relies heavily on volunteers with the good intentions of providing a superior built environment for those in need. Its methodologies appear to be cost conscious, practical, and easily implemented by current building practices. The foundation also seeks quality through its own R&D department charged with vetting materials, designs, and means & methods. Still, these measures failed to piece together a building that can truly be called resilient. Instead, we see structures that are somewhat conventional, clad in Urban Modern but green-washed as storm-resistant and healthy. We see a process that is part building science and part social experiment run amok. Other green projects even more lofty than Make It Right have stumbled mightily. While our green industry is quick to dismiss such mishaps as inevitable stumbling blocks, a very different view can be had by green critics and, more importantly, the general public who is the ultimate judge of the value of high-performing buildings. Whether you espouse to the green revolution or question its staying power, the importance of good design cannot be ignored or jeopardized for the sake of any one facet of the design’s intent. The building is a whole and must perform as such in all aspects of its design. The building envelope figures prominently in the success or failure of high-performing buildings. But presently, building enclosure commissioning (BECx) is not a priority of LEED and other green, high-performing initiatives. Even passive house and net-zero underachieve from lack of third-party plan review and robust field verification of key construction phases. Overemphasis on air barriers and post-construction blower door tests miss the mark on true durability. In all, it appears that pragmatic, less glorified aspects of durable design have not yet seeped into the mindset of green building, thus rendering many high-profile endeavors big on style but short on substance. Commissioning and performance audits serve to validate or dispel building performance claims. It’s where perception meets reality and it’s where many projects fall short of expectations. Building enclosure commissioning takes a major step forward in addressing current QA shortfalls by outlining a quality-oriented process for achieving, verifying, and documenting performance. The advantage of commissioning stems from its basis in design intent and verified performance – objectives that represent the very essence of green, high-performing buildings. The commissioning scope, stringency, and schedule all remain highly flexible, determined solely by the owner’s project requirements. By design, building commissioning is responsive to the owner’s needs and priorities; and it therefore offers the surest means for achieving high-performing green buildings. We are at a crossroads where society’s increasing acceptance of green principles creates new opportunities for high-performing buildings as well as new prospects for the people who design, build and occupy them. Conversely, we stand witness to the birth of an architectural calamity never before seen – one born from undelivered promises and underachieving design. The time has never been more right to mesh resilient design with building enclosure commissioning – not as an overlay to existing green quality practices, but as its replacement.